WHS Class of 1960 Where are you? PLACE: Home of Richard and Giget Penn, 848 Waite St. Eugene, OR 9i7402. Meat - Buns - Condiments - Table service provided. BRING a side dish or dessert and beverage you want and lawn chair. HOPE TO SEE YOU THERE!!!!! Please let us know by Aug. 20 if you plan to come so we know how much meat to purchase. 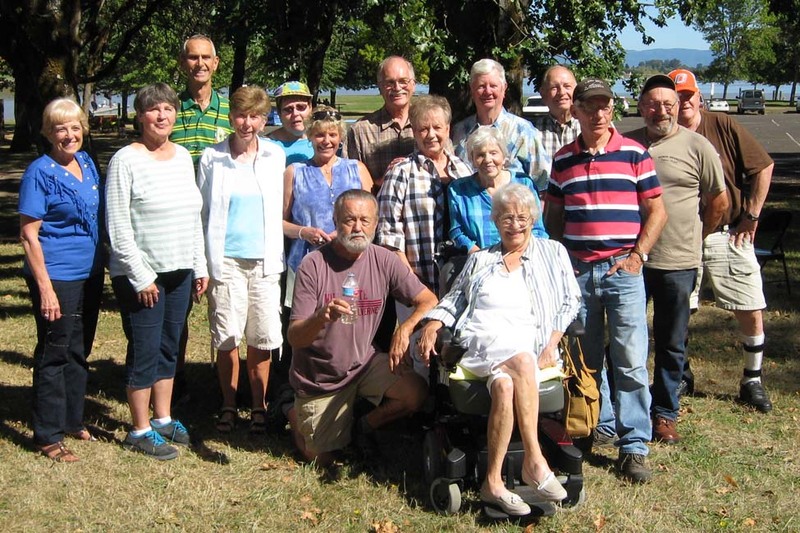 PLACE: Jack and Sandy Olson have graciously volunteered to have the picnic at their lovely home. Directions to their home will follow in a later e-mail. Bring whatever food and drink you want. If you want to attend the picnic and are not able to get yourself there, please contact Sharon Swenson at sharon2641@comcast.net. for a ride to the picnic. DIRECTIONS: I - 5 south of Eugene turn at Goshen exit on to Highway 58 go through Pleasesnt Hill turn left at the flashing yellow light, Park Way turn right at Jasper. Drive east to Fall Creek sign (about 5 Miles) turn left ( this is the only place you can mess up) drive east you will see Little Fall Creek Market (on your right) after 3 miles. Keep going east. At 3 mile marker turn left Renegade Lane. There is a Rocky Knoll sign in the field go up road turn right on first driveway off Renegade Lane. (Renegade Lane) It has a sign and marker You will see a sign 84953 Renegade Lane. You can use a GPS Good luck hope to see all of my classmates. There are areas for campers at the shop. Lots of room 23 acres. Hiking tails and garden tours. Class Picnic, Thursday, September 15, 2016. Fern Ridge Lake, Richardson Park, Site 2. 11 - 4. Hello classmates, This is your dinner reminder for Monday, Oct.12th at Countryside Pizza and Grill at 5:00 P.M. We had a great picnic. Those attending were: Jayne (Byers) and Gary Weis; Richard and Linda Sneed; Tom Christian; Nikki (Niederer) Pellet and her brother John; Don and Carol Middleton; Jack Olson; Sharrel Davison; Patty (Marchbank) and Mike Mason; Lawrence and Marki Grenon; Tom and Becky Gregersen; Sharon (Wolf) Lemery; Phil and Donna Goldbeck; Bill and Anita (Grenon) Cook; Sandy (Ball) and Brian Emerson; Donna (Blossom) and Gary Kernutt; Marianne (Thomas) Swenson and her son Joseph; Carol Devereaux. Lawrence asked me to let classmates know he has redone the WHS website to make it more compatible to smart phones and tablets. Pictures from the picnic are on the webpage. Lawrence wants to know whoever had the 6th grade picture at the picnic could you scan it and sent to Lawrence. See you at the DINNER OCT. 12.